1. Balancing Technique: In according to the gas flow principle, it is applied optimal design of big wind wheel structure to ensure stable running of wind wheel to realize big wind and low noise. 2. Intelligent control: Equipped with infrared ray transmitting/receiving devices with SCM control technique, it has stable performance and can power off after continue running for 50 seconds. 3. 8000 hours failure-free operation: Adopting high-speed series integration electrical machinery. 5. Protection for over temperature and over current: Due to over temperature and over current multi-protection for nickel-chromium heating wire with imported overheating protection, it is safer to operate. 1. More steady performance & precise controlling effect: Equipped with full automatic infrared ray induction system & advanced chip controlled technology. 2. Professional design & fashionable style: With novel appearance & smooth lines & film screen technology. 3. 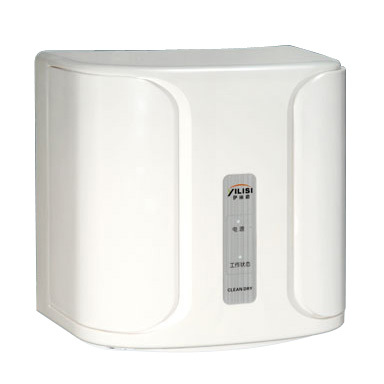 With high-speed motor for special purpose & low noise, it is high efficiency for it just needs 10-15 seconds to dry hands. 4. With humanization water receiver avoiding wetting floor during drying hands, it makes the floor clean & glabrous. 5. Firm, durable, beautiful & shinning: With imported engineering plastic & metallic paint. 6. Safe: With multi-protection for over temperature, over currency & over time.